Do you have your original shipping container? You’re going to need it. Our shipping container is engineered to keep UPS from destroying the clock – which does happen. If we receive a clock and the shipping container is in bad shape, we won’t reuse it. Need to pack your Geochron? Depending on the way your box opens, follow these instructions! Make sure to note your serial number and include your Return Authorization Form, as we’ll need it later. You have two options when ordering your Shipping Carton. Any shipping retail outlet is going to be more expensive than shipping your clock on our account, maybe up to 50%! Why? Because we’re spending $50,000 a year on shipping so we get discount. Take it to your UPS or Fedex store, and you’ll pay full price. Plus, when you ship through Geochron, it’s automatically insured which does come in handy if the driver is having a bad day. Includes a large container engineered specifically for the clock, and packaging materials to ensure your clock makes the journey safely. Also includes a return label used to send the unit back to the factory! Please note that this price does not include return shipping to the factory. You may want our Shipping Carton System with Return Label instead! If you already have a shipping carton, you’ll just need a return label to get your clock on its way back to the factory. 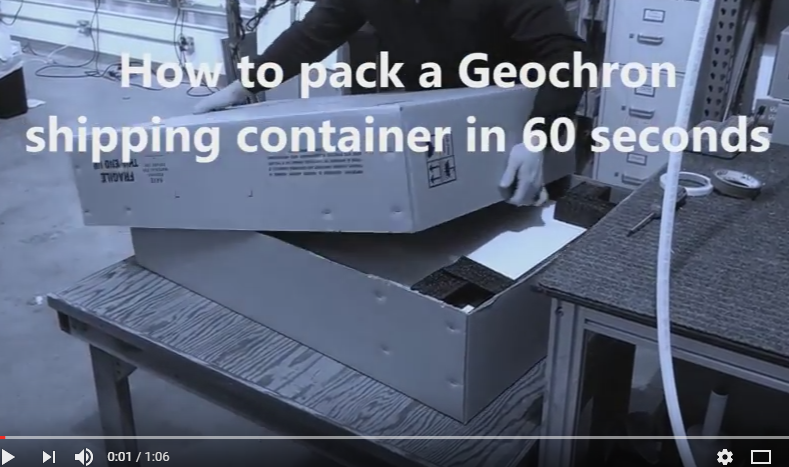 Don’t forget to check out our helpful packing instruction video to ensure your clock has a safe trip.